AMD shows off the FirePro S10000, a new dual-GPU solution for the server and workstation market. 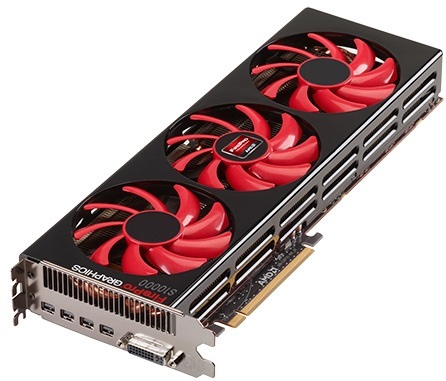 The card features two Tahiti GPUs, delivering a total of 3584 shaders with a clockspeed of 825MHz, a 384-bit memory bus, and a total of 6GB ECC GDDR5 memory with a memory bandwidth of 480GB/s. According to AMD, the card delivers a single-precision computing power of up to 5.91 teraflops and double-precision performance of 1.48 teraflops. That's more than what NVIDIA's upcoming Tesla K20 is anticipated to deliver, leaked details reveal this card has 3.52 teraflops single-precision and 1.17 teraflops double-precision computing power. The downside however is that AMD's Fire Pro S10000 has a TDP of 375W, wheras the Tesla K20 has a TDP of 225W. At $3,599 the FirePro S10000 card is also more expensive than NVIDIA's model, which is rumored to have a $3,199 price tag, and the dual-slot cooling solution with three fans seems like a weird fit for the server market. AMD today launched the AMD FirePro S10000, the industry's most powerful server graphics card, designed for high-performance computing (HPC) workloads and graphics intensive applications. The AMD FirePro S10000 is the first professional-grade card to exceed one teraFLOPS (TFLOPS) of double-precision floating-point performance, helping to ensure optimal efficiency for HPC calculations. It is also the first ultra high-end card that brings an unprecedented 5.91 TFLOPS of peak single-precision and 1.48 TFLOPS of double-precision floating-point calculations. This performance ensures the fastest possible data processing speeds for professionals working with large amounts of information. In addition to HPC, the FirePro S10000 is also ideal for virtual desktop infrastructure (VDI) and workstation graphics deployments. "The demands placed on servers by compute and graphics-intensive workloads continues to grow exponentially as professionals work with larger data sets to design and engineer new products and services," said David Cummings, senior director and general manager, Professional Graphics, AMD. "The AMD FirePro S10000, equipped with our Graphics Core Next Architecture, enables server graphics to play a dual role in providing both compute and graphics horsepower simultaneously. This is executed without compromising performance for users while helping reduce the total cost of ownership for IT managers." Equipped with AMD next-generation Graphics Core Next Architecture, the FirePro S10000 brings high performance computing and visualization to a variety of disciplines such as finance, oil exploration, aeronautics, automotive design and engineering, geophysics, life sciences, medicine and defense. With dual GPUs at work, professionals can experience high throughput, low latency transfers allowing for quick compute of complex calculations requiring high accuracy. OpenCL Support: OpenCL has become the compute programming language of choice among developers looking to take full advantage of the combined parallel processing capabilities of the FirePro S10000. This has accelerated computer-aided design (CAD), computer-aided engineering (CAE), and media and entertainment (M&E) software, changing the way professionals work thanks to performance and functionality improvements. Please visit AMD at SC12, booth #2019, to see the AMD FirePro S10000 power the latest in graphics technology.